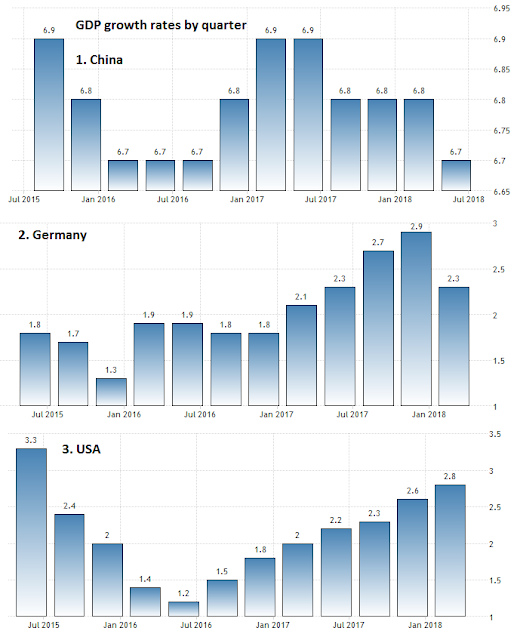 GDP quarterly growth of the Big 3. (1) China keeps high growth but decelerating this year. (2) Germany picking up speed but decelerating also this year. (3) USA picking up speed, consistently. Many anti-T will be unhappy to see numbers like this. For them, Mr T is "evil, insane, misogynist,..." he should be leading the US economy to oblivion. By John Binder 19 Jul 2018Washington, D.C. The tax cut, bureaucracy cut, spending cut on certain programs like climate junkets and bureaucracies, other market-oriented reforms in the US must have contributed to this generally positive development.